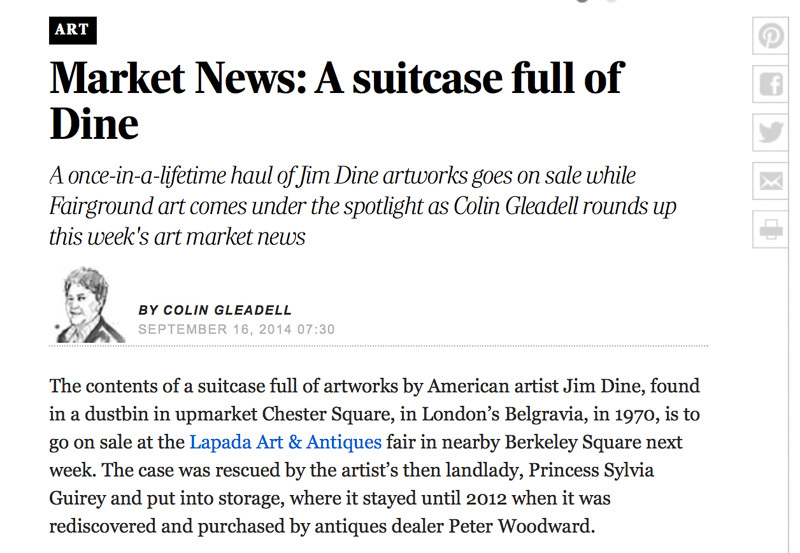 The contents of a suitcase full of artworks by American artist Jim Dine, found in a dustbin in upmarket Chester Square, in London’s Belgravia, in 1970, is to go on sale at the Lapada Art & Antiques fair in nearby Berkeley Square next week. The case was rescued by the artist’s then landlady, Princess Sylvia Guirey and put into storage, where it stayed until 2012 when it was rediscovered and purchased by antiques dealer Peter Woodward. Departing from some of the styles and subjects that characterise Dine’s earlier output, the works – mainly working sketches for print blocks – represent a turning point in the artist’s career, moving towards the quieter more controlled techniques seen in the Sixties and Seventies. 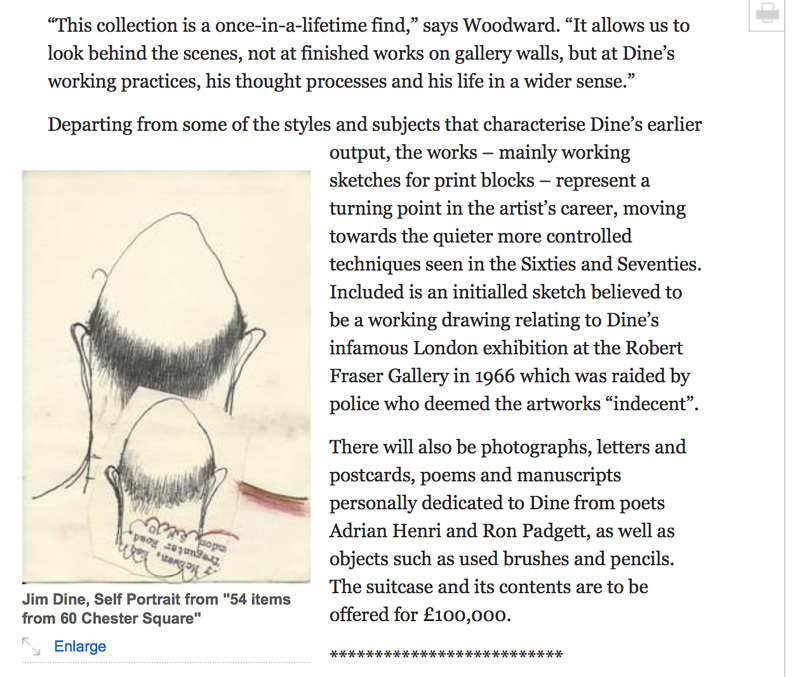 Included is an initialled sketch believed to be a working drawing relating to Dine’s infamous London exhibition at the Robert Fraser Gallery in 1966 which was raided by police who deemed the artworks “indecent”. There will also be photographs, letters and postcards, poems and manuscripts personally dedicated to Dine from poets Adrian Henri and Ron Padgett, as well as objects such as used brushes and pencils. 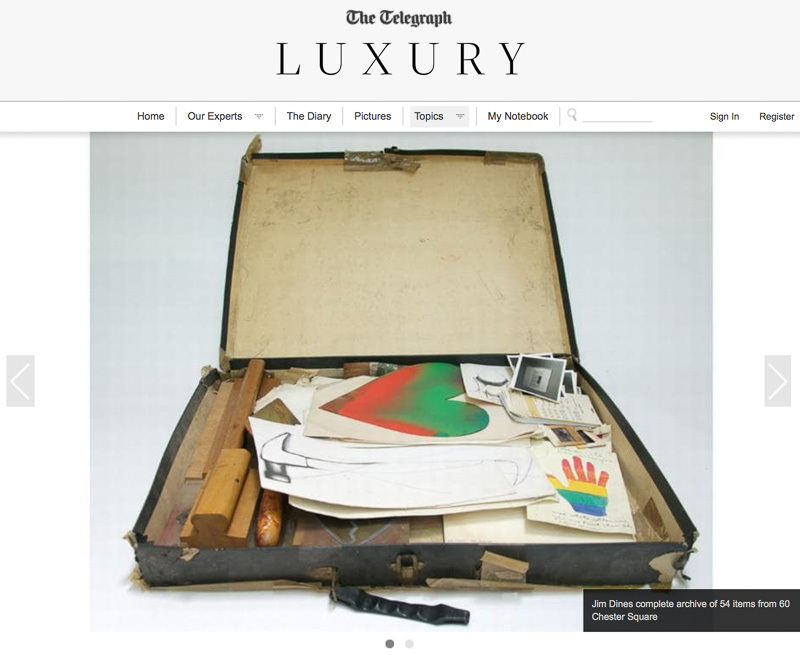 The suitcase and its contents are to be offered for £100,000.